Barcode Director use powerful ClearImage barcode recognition engines to read most difficult barcodes. There are corner cases of damaged, distorted or out-of-spec barcodes that might need additional processing to be read. Use this panel to activate available imaging scripts to do pre-processing. Lists scripts installed on the system and not selected for use yet. Scripts are binary files with .cbs extension located in Scripts subdirectory of Barcode Director directory. Imaging scripts are supplied by Inlite Research support. NOTE: At list one item should be present in the list before session starts. If no custom scripts are specified No-Script entry should be present. Each selected scripts increases session's processing time. Therefore only scripts that improve barcode recognition should be activated. 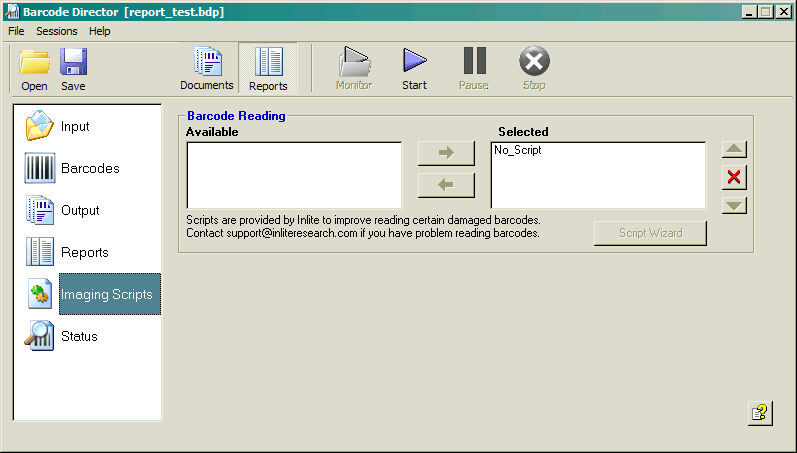 Script Wizard automatically identifies set of scripts to maximize recognition of a given set barcoded images. Imaging scripts, selected on Imaging Scripts panel, are supplied by Inlite Research support. Contact sales@inliteresearch.com to get a quote for development and licensing imaging scripts. There is no guarantee that scrips will be able to fix all the problems encountered in your image files. The script execution will increase Session time. Only scripts that increase recognition rate should be activated.